including both those of Buddha and those of the commentator, are divided into 2,547 banawaras, containing 737,000 stanzas, and 29,368,000 separate letters. made for a hundred years. coin can be in copper, silver or gold. 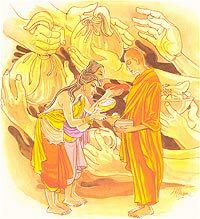 Dhamma, which would surely take one to the Brahma world. indeed, better than a hundred years of making offerings (to ordinary people). Learn to Swim Camp will be organised and conducted by aTeam of Professional Coaches who trains for the competitive Levels and the Karnataka State Team. Swimming Coaching camp will be for a period of 4 weeks.